King Arthur's Court beings to take shape. He is South African but he is also the right man for the job. And with the Australian Summer of Cricket for 2011/2012 about to begin, Australia's new Cricket Coach Mickey Arthur has a lot to accomplish before the first ball is bowled. Not least to begin convincing some Australians that having a South African in charge of the national team is a good idea. A national team currently ranked 4th in Test Cricket, 1st in One Day Internationals and 5th in T20 entering the Australian summer. It will be Arthur's job to improve at least two of those three rankings, and it will not be easy. Australia have just returned from Arthur's home country (where he was South Africa's coach from 2005-2010) splitting a painfully short Test Series 1-1, winning the One Day Series 2-1 and taking a game each of the utterly superfluous T20 double. There's no denying that those results are solid against one of the powers of world cricket, but when a teenager by the name of Patrick Cummins hit the winning runs in the 2nd Test in Johannesburg on November 21st, Australia still didn't have a full time head coach and the biggest story seemed to be whether or not Ricky Ponting's 62 in the 2nd Innings was enough to hold his spot for the 1st Test with New Zealand at the Gabba on December 1st. Then in stunning news just days after Arthur's appointment, comes the realisation that Ponting's form is no longer the lead story concerning the Australian Cricket Team (well apart from any article written by News Limited's Malcolm 'What has Ricky Ponting done for me lately?' Conn in the last month - Click here for just one example of his anti-Pontiff rhetoric). Instead Cricket Australia revealed that Shane Watson (hamstring), Ryan Harris (pelvis), Shaun Marsh (back), Mitchell Johnson (foot) and Cummins (heel) are all OUT of the race to play in the 1st Test v New Zealand and Arthur's first test in charge would feature many new faces. While Harris and Marsh did not play in the last test in Johannesburg, they did play in the opening test in Cape Town so adding up those withdrawals, it appears just EIGHT players from the 13 that featured in the Test Series against South Africa will be available for the Gabba! But it also provides Arthur and the new National Selection Panel (headed by John Inverarity and featuring Arthur, captain Michael Clarke and NSP members Rod Marsh and Andy Bichel) a chance to make some educated changes to the lineup, even if they may not be in the positions they thought they might have to address just a week ago. This article explores the options available to the Arthur and the NSP and also the 1st Test Squad. See Arthur's first press conference as Australia's Cricket Coach here. Below the 1st Test Squad is a comprehensive look at 33 players we believe could be in the mix for a Test Match berth this summer. Here is the 1st Test Squad v New Zealand and following that list are all the options before Arthur as he shapes the future of Camelot... errr Australian Cricket. The batting lineup will be Phillip Hughes, David Warner, Usman Khawaja, Ricky Ponting, Michael Clarke (c), Michael Hussey and Brad Haddin. The bowling will feature Peter Siddle, Nathan Lyon and two of James Pattinson, Ben Cutting or Mitchell Starc. Trent Copeland tragically misses out... doing the job he was asked to do in Sri Lanka has somehow backfired in a big way. What do you think of the 1st Test Team v New Zealand? 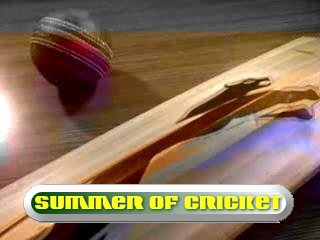 SUMMER OF CRICKET PREVIEW CONTINUED... 33 PLAYERS PROFILED. 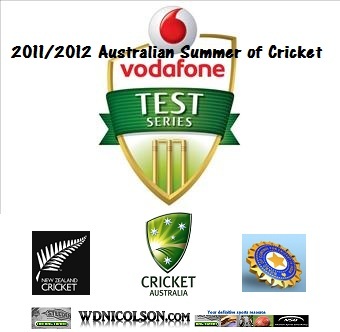 So here on www.wdnicolson.com is a breakdown of the options available to the NSP, Arthur and Clarke for the upcoming Australian Summer of Cricket for Season 2011/2012. How Arthur shapes his squad in the coming months will be very interesting to watch. Can he bring out the best in Australian Cricket straight away with Tests against New Zealand and then India to come this summer? New Zealand always lift to play Australia (in another ridiculously short 2 Test Series - thanks Cricket Australia) and a 4 Test Series against India is a big ask if the wickets spin or are batting friendly (about the only surface India really struggle on are seaming decks - see their recent tour of England). With so many injuries leading into the opening of the Summer - what is a realistic goal for Arthur to aim for? The bare minimum will be a Test Series win over New Zealand and a drawn series with India. But with the players available to him - is that achievable? Below is a comprehensive list of all the options available to Arthur this summer - what would your squad be? 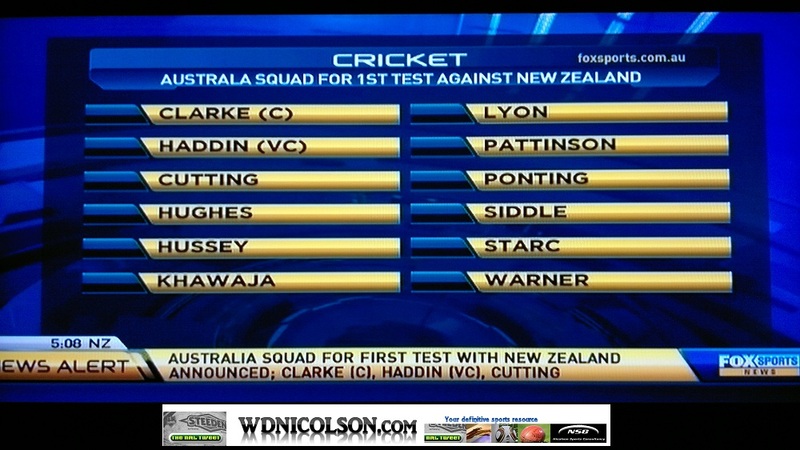 All players listed are with TEST CRICKET in mind. Other players will no doubt come into the mix for the One Day Internationals and T20 Cricket. Shane WATSON - the incumbent all-rounder in the team will miss the 1st Test with a hamstring strain. And even if he returns for the 2nd Test in Hobart, he still may not be able to bowl. He is the second player picked in the team after Michael Clarke when healthy. Had avoided the injury curse for an extended period, so even at 30, Watson's future in the team is secure. Phillip HUGHES - still has a good record in Test Cricket averaging nearly 40 (39.56) in 10 Test Matches, but his best performances have carried a bunch of failures. Will get every opportunity this Summer but has to take it. David WARNER - Short form specialist has some runs on the board in the longer format and hit 65 runs from 90 balls in the Australia A game v New Zealand. Offers a different dynamic to any team at the top of the order and in Test Cricket this may be a gamble Australia benefit from taking. Also a fine outfielder. Simon KATICH - Cast aside in the youth movement (or very slight shift) by the previous NSP, Katich remains intent on playing Test Cricket but the promotion of Warner means his career looks done. Extremely effective batsman and one almost any captain would want opening the innings at any level... except Australia's. Ed COWAN - Produced a big hundred in the Australia A game v New Zealand in Brisbane to underline his Sheffield Shield form for Tasmania. Has hit 368 runs at 46.00 so far this First Class Season. Scored 133 in the Shield Final last season. At 29 he is a few cabs off the rank for an opening spot in the Australian team and appears a long shot to get a chance. Usman KHAWAJA - Lost his spot in the Test Team because Shaun Marsh scored a century on début... regained it when Marsh's back played up yet again. Great technique and has the temperament to bat anywhere in the Top 6. May not hold onto the #3 job long term but that could be because Australia move him to opener should Hughes struggle and/or Watson swaps places with him. Shaun MARSH - Prodigious striker of the ball with a bad back. Made the most of his chance in Sri Lanka but needs to recover from his injury problems pronto to get his spot back. Like Khawaja could find himself opening should Watson move down to #3 once healthy. Has plenty of ability. Ricky PONTING - Still a level above any of the other options in the Australian middle order not named Michael Clarke or Michael Hussey. There are signs that the pull shot that deserted him in the last two years is coming back and that is a GREAT sign. Not so much is the missing of the straighter deliveries. Still class and can offer plenty for the summer ahead, even if it is indeed his last for Australia. Michael CLARKE - Resisted the chance to move himself into the #4 spot long term and shuffled down a spot to allow Ponting to play in the strokemakers position instead. Is a proactive skipper which is a plus but should roll the arm over just a little bit more here and there. Looks to be on top of his game with the bat - a huge plus for when you are also carrying the mantle of Australian skipper. Michael HUSSEY - Tore up the Sri Lankan bowling and despite not continuing with a big score against South Africa - still has it. 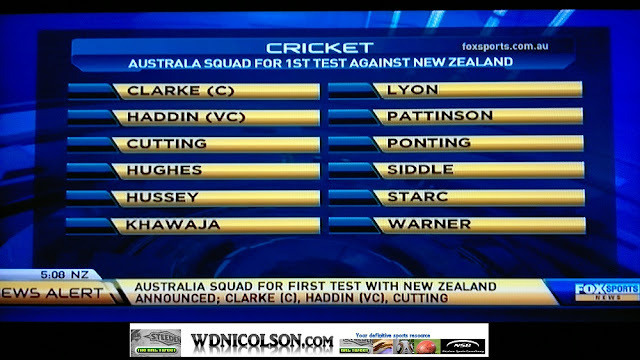 Having Hussey at #6 following Ponting and Clarke in the middle order is now the strength of the team. Question will be whether or not the selectors want to push another all-rounder into the team at #6 by the end of the summer... but it will only happen if Hussey falters terribly, which is unlikely. Callum FERGUSON - Classiest batsman in Australia not in Australia's plans going by the lineup for the Australia A team that preferred Steven Smith and Matthew Wade to another genuine batsman in that lineup. Excellent off his legs and a fine driver of the ball. Needs a big middle summer push to get back into the ODI mix where he has carved up for Australia (he averages 41.43 in ODIs). 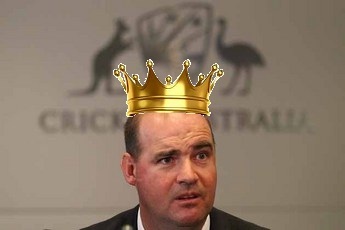 He's the best option for the middle order if Australia try to replace Ponting or Hussey in my view. Mitchell MARSH - Bolter but has some ODI experience and can bat and bowl in the way Australia might be after for that all-rounder at #6 role. Plus at 20 years of age he's one exciting talent. Look for him to play a big part in the returning ODI Tri-Series before the NSP start thinking Test Cricket for the kid. Brad HADDIN - Surely he needs runs in both Tests against New Zealand to hold his spot with Matthew Wade scoring runs and Tim Paine not far off returning. His 55 was valuable but the form needs to return en masse because he's not in the class of the other Australian bats under pressure. Runs are your friend Brad Haddin, so score them. Matthew WADE - Got his chance for Australia A with a torrent of runs for Victoria and his good glovework. Next in line because Tim Paine hasn't fully recovered from a finger injury. If he gets a chance he HAS to take it because Paine (when healthy) was poised to replace Haddin very shortly. Tim PAINE - If his finger injury gets the all clear then Tim Paine may only need a stint in the KFC Big Bash to push his way into the ODI or T20 national squad. Lovely batsman to watch and athletic keeper. The Test Series against India might come a little early for him to push back past Matthew Wade to pressure Brad Haddin but we'll see. Nathan LYON - He's Jason Krejza 2.0. In that he can genuinely spin the ball and took wickets on début. He has also leaked runs but he's going to get an extended run at the spinning spot - just like Krejza should have got. Let's see how he goes this summer, because there's not exactly a far better option to go with. Michael BEER - Came out of nowhere (ok Western Australia) and got a run in the final Ashes Test, taking 1/112 from 38 overs at the SCG. Hard to see him pushing past Lyon unless he starts taking a lot of wickets at Shield level. Steven SMITH - Needs to make his leg spin a priority to get back into the mix for Australia. Just not a good enough batsman to warrant a place in the Top 6 and not a good enough spinner to take Lyon's spot. So off to the nets young Steven... and bowl, bowl, bowl. Steven O'KEEFE - Split webbing from a Shield game put pay to the rest of 2011 and he'll need a huge start to 2012 to get in consideration for the summer's shorter form games. Xavier DOHERTY - Will play in the ODI's probably but Test Cricket came and went in a flash for the left arm offie. It won't flash again. Ryan HARRIS - Great when he plays but doesn't play often enough. Creates genuine movement with the new ball and is a strike weapon. But he can't stay on the field and there are a few young whipper-snappers who might snap up his spot if he can't get fit. In Australia's best XI at the moment. Patrick CUMMINS - Wonderful debut but a heel injury he was troubled by throughout the test is a worry. Not so much that he got hurt but that after just one test he can't play through it. This is where Cricket Australia needs to realise that sometimes the risk of pulling a player out of a squad for a relatively minor injury does more damage in the long term than the short term. If Cummins is kept in cotton wool for 2 or 3 weeks and Australia dominate the Kiwis - can they justify bringing Cummins back into the team for a performing incumbent? That being said - the kid can bowl fast and even better - he bowls full. Australia just needs to let him bowl. Mitchell JOHNSON - Foot injury halts what was a decent series against South Africa. Yes he bowled plenty of 4 balls but he also looked likely. Still Australia's 'x-factor' in the attack, even with Cummins and Harris fit. Problem he's got is A. Getting healthy, and B. Showing that he's still got that 'x-factor' in him. Trent COPELAND - Did EXACTLY the job Australia asked of him v Sri Lanka in his first series and was punted for Peter Siddle once they arrived in South African. If we can't figure out why his miserly bowling and consistency can't get a run in the Test Team, how do you think he feels? Peter SIDDLE - It's no secret he's no favourite of this writer. Bowling short of a length followed by a four ball followed by more of the same does not a Test Cricket bowler make. Came in for the desperately unlucky Stuart Clark (well before Clark was finished at Test level) and has one hat-trick and a boatload of fruit to show for 25 Tests for Australia. The king of taking place saving but relatively meaningless wickets when the opposition has piled on the runs. Just not a match-winner and Australia keep pushing out better bowlers to accommodate his place in the squad. It was time to move on years ago. Doug BOLLINGER - The left arm quick might have had his time in the sun for Australia. Could very well be back in the ODI squad if he is fit but the Test arena might be a memory rather than something to look forward to for the likeable 'Doug the Rug'. James PATTINSON - May get his chance in the 1st Test v New Zealand after making the squad. Good new ball bowler who can bowl full and let the ball move around. Also good returning for a second spell. But is he cut out for Test Cricket? That's the question that needs to be answered at the Gabba. Ben CUTTING - Good lower order hitter... but he's in for his bowling. And by in - we mean in the 1st Test Squad for the New Zealand series. Is he a Test class bowler? Well we'll find out soon enough, as he'll probably edge out Mitchell Starc for the last spot in the Gabba XI. Mitchell STARC - Rocketed into Test calculations with a good start to the domestic summer. Injuries to Mitchell Johnson and Doug Bollinger however are the main reason he's been accelerated into the squad, which leaves Trent Copeland feeling very Stuart Clark-ish from a few years ago. Clint McKAY - Injury killed his shot at the big time and although he's fighting back this summer, he is behind a number of seamers for a chance. James FAULKNER - Left arm bowling all-rounder who would certainly offer a point of difference in any Australian team. Luke BUTTERWORTH - All-rounder should get his chance in the ODIs or T20s if he has a big KFC Big Bash. Who have we missed out that is a genuine chance at playing Test Cricket this summer? Also if you've got a preferred Test XI, ODI XI or T20 XI - please list it in the comments below. Mickey Arthur has one gigantic job ahead, some of his key players are injured and of those new (and old options) available to him, not many are slam dunks to get the job done at Test level. So we'll have to wait and see if the Knights of his Australian Round Table can do the job against New Zealand and India this summer. And in the process we'll find out how comfortable the crown sits atop his head by the end of it.